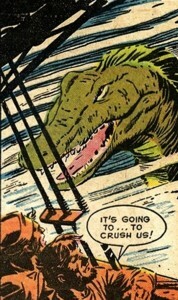 Powers/Abilities: This creature was a large green-skinned sea reptile, somewhat resembling a tylosaurus. History: (Astonishing I#60/2 (fb) - BTS) - The origin of the "Monster in the Mist" is unrevealed (see comments), but by the 16th Century, it had reached maturity and was swimming the Philippine waters. In 1519, the explorer Magellan sailed to the Philippines in an attempt to follow Columbus' route, but one of his ships--Vittoria--was lost and wrecked by the monster (see comments). The ship struck ground on the shore of an uncharted deserted island, stranding its surviving crew. In an attempt to get rescued, one of the marooned sailors threw a message in a bottle into the sea--the message gave the island's location and warned of the sea serpent. 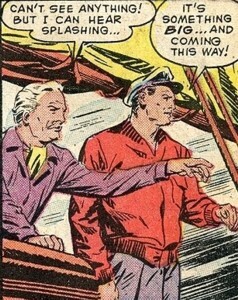 (Astonishing I#60/2) - In the 20th Century, Professor Kerrin lead an expedition aboard a fishing trawler, where they were dragging the depths of the Philippine waters in hopes of finding the fossilized remains of a sea serpent. 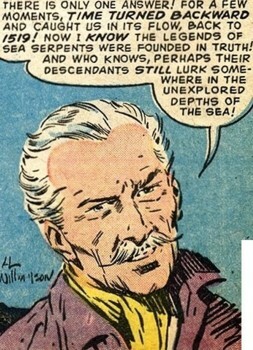 Although the trawler's captain was incredulous of the scientist's quest, Kerrin told him that the legends of sea serpents may have been based on fact, for there had been many reports of sightings of the creatures by ships of the Fifteenth Century when they sailed those very same waters. 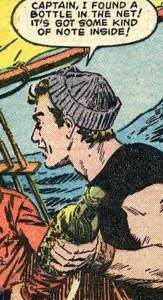 Then one of the trawler's crewmen reported that he found something caught in the net--a bottle with a note inside. The note was written in old Portuguese, so the captain gave it to Francisco, who translated it--the note stated that a ship was wrecked on a nearby island, but it also warned of a sea serpent. 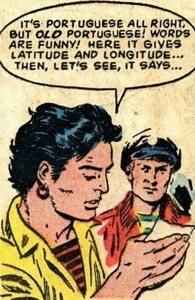 The note mentioned the island's longitude and latitude, which the captain recognized--he knew the island's owner, who had a plantation there--so the trawler sailed to the island on a rescue mission; but the captain wondered why anyone would so desperately need to be rescued from a modern island paradise. As the trawler neared its destination, it sailed into a heavy white mist that enveloped it--there was a sudden eerie stillness and a complete absence of sound, as if the world had ceased to exist. The mist cleared and the trawler came upon the island, but it was changed from the last time the captain had been there, for it appeared to be uninhabited, with no sign of civilization. On the rocks by the shore, they saw the recently-wrecked hulk of an old-style sailing vessel (Vittoria). Then they heard a great splashing in the waters and saw a huge sea serpent headed straight for them. The trawler narrowly escaped the monster as the captain and crew maneuvered it back into the mist. Suddenly, the mist was gone, and the monster had vanished; the men found themselves off the shore of the same island, which now had the modern plantation. 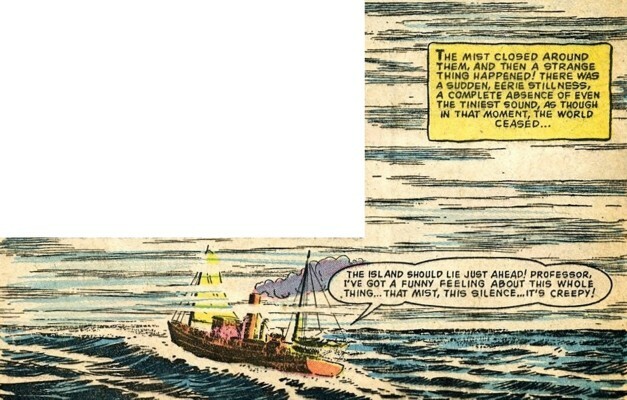 The captain was perplexed by what had happened, but Professor Kerrin predicted that the remains of the wrecked ship could now be found under the water's surface. Kerrin explained that the bottle with the note they had found was very old, from about the 16th Century, so the ship-wrecked sailors were long dead. Kerrin told the captain about Magellan's ship Vittoria, which was supposedly wrecked by a sea serpent, and he theorized that when the trawler had passed through the mysterious mist, they had somehow traveled backward in time. Convinced that the legends of sea serpents were founded in truth, Kerrin theorized that descendants of the creature still lurked in the ocean's depths. The creature was never named in the story, so I just identified it by the story-title. Assuming that the monster wasn't some prehistoric beast that somehow managed to survive the extinction of the dinosaurs, possibly it was the work of the Deviants, who were known to have created at least one modern-day dinosaur. In real-life history, the Vittoria actually survived its voyage and returned to Spain (for details, see HERE). In regards to that mysterious mist that sent the trawler back to the 16th Century: Perhaps it had some connection to the fog that temporarily transported Dan Cooper to the 16th Century. This story was reprinted (in black-and-white) in Monsters Unleashed!#7. A paleontologist, he chartered a fishing trawler to drag its nets in the depths of the Philippine waters, in search of the fossilized remains of sea serpents; Kerrin knew of many claims of sea serpents reported by ships that had sailed those very waters in the 15th Century. 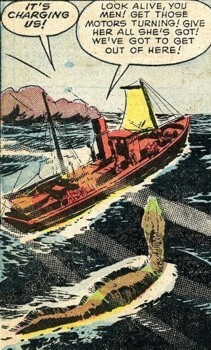 Kerrin was aboard the trawler when it sailed into a strange mist and crossed paths with a living sea serpent. After the trawler went back through the mist and escaped the monster, Kerrin theorized that they had somehow traveled back to the 16th Century. After their encounter with the "Monster in the Mist," Kerrin was convinced that the legends of sea serpents were based on truth, and perhaps descendants of the creature still lurked in the depths of the sea. He commanded the fishing trawler that was chartered by Professor Kerrin for his expedition for fossils. When his crew found a message in a bottle from shipwrecked sailors marooned on an island, the captain recognized the location of the island and ordered his men to sail there for a rescue mission. 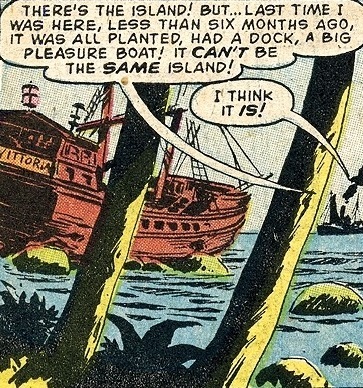 But just before they reached the island, they sailed into a mysterious mist and were somehow transported back to the 16th Century, where they were attacked by a sea serpent. As the trawler evaded the monster and sailed back into the mist, the captain and his crew were returned to the 20th century. They were among the unspecified number of men aboard the fishing trawler. 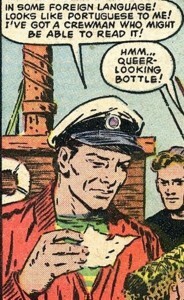 The unidentified crewman discovered a bottle with a note inside that was caught in the net. Francisco was able to read the note, which he recognized as being written in old Portuguese. He translated the note for the captain, which gave the location of some marooned sailors, but it also warned of a sea serpent. The unidentified crewman and Francisco were aboard the trawler when it sailed into a mist and was temporarily transported back to the 16th Century. They were threatened by the "Monster in the Mist" until the trawler went back into the mist and returned home to the 20th Century. Commanded by an unidentified captain, its crew included an unidentified crewman and Francisco. It was chartered by Professor Kerrin's expedition to drag its nets in the Philippine waters in search of the fossilized remains of a sea serpent. The trawler sailed into a mysterious mist and it was transported back in time to the 16th century, where it was attacked by a sea serpent. After narrowly escaping the monster, the crew was able to pilot the boat back through the mist and return to the 20th Century. One of the ships used by Ferdinand Magellan in the 16th Century, it was wrecked by a sea serpent and hit the rocks by the shore of an island near the Philippines, where the surviving crew-members were marooned (see comments). Shortly afterward, its wreckage was sighted by a 20th Century fishing trawler, which had been transported back in time after it sailed into a mysterious mist.